If you’ve been a member of the ShamFrip tribe for a while, you’ll know my deep love affair with Chanel Le Blanc De Chanel Sheer Illuminating Base. I’ve turned drugstores upside down in an effort to provide a more affordable alternative… How about L’Oreal Lumi Magique*? Do we have a dupe? Let’s find out. 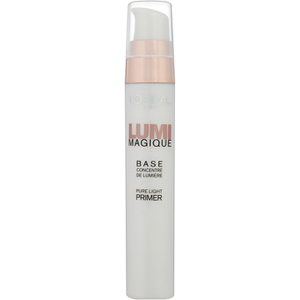 * As far as I can tell, the Lumi Magique Pure Light Primer is known as Magic Lumi Light Infusing Primer in the US, identical product. Like dat. 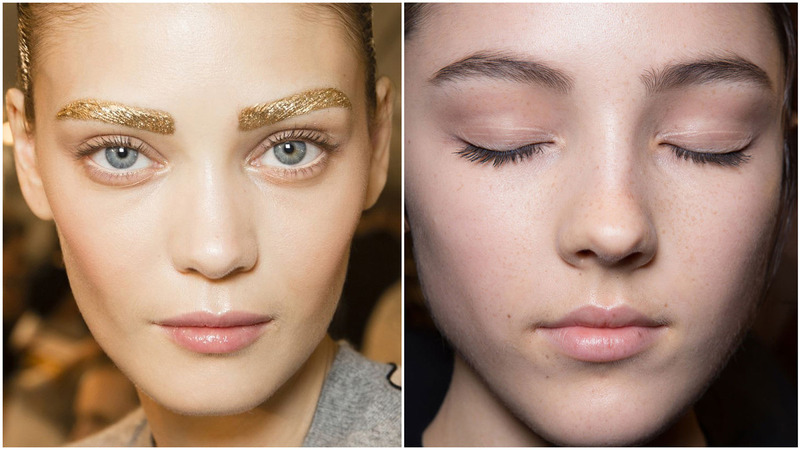 In less cryptic terms, we’re talking sophisticated luminosity without shimmer or overt glossy finishes. Both Le Blanc De Chanel and Lumi Magique are thin white fluids that impart a slight white cast (a touch more pronounced in the Chanel). Both provide subtle luminosity and can be used via three means: underneath foundation, mixed with foundation or dabbed over foundation. If you’re using a conventional pore primer, apply that first and treat these products as illuminators. Neither provide coverage so to speak, unless you are paper white in which case, the white cast works in your favour. I do find that both products deflect shadows so could be described as complexion perfectors. Due to the slight white cast, both will lift a foundation shade if mixed (0.5 to 1 shade, depending on ratio mixed) although if you have no desire to lighten your base, apply the fluid prior to foundation as opposed to mixing. Do note that mixing will also sheer out a foundation somewhat. Another means of comparison, if you feel as though the Becca Shimmering Skin Perfectors are wayyyy too shimmery for your liking, the Le Blanc De Chanel and Lumi Magique offer a more muted ‘glow’ (if there ever was a less descriptive word). As I’ve mentioned above, the Chanel offers a sophisticated luminosity but is entirely void of shimmer. However, the L’Oreal Lumi Magique definitely has reflect – I’d call it a fine white shimmer that leans warm. For experimental purposes, I applied multiple layers of the Lumi Magique and the outcome was an even frost (a muted frost, but frost nonetheless). I couldn’t capture this on camera but without a doubt, any eye could detect the shimmer. The Chanel is more emollient and remains slightly tacky on the skin, so there is a bit of sheen goin’ on. On the other hand, the Lumi Magique sets entirely and any luminosity is a function of the reflect and white cast. A special mention for the sensitive noses out there (I got you gurl), Le Blanc De Chanel is strong on the fragrance front; I find it quite pleasant although you gotta like your floral scents (you pay the big bucks for the nose assault, right?). Likewise, The Lumi Magique has a floral aroma but so soft and so fleeting, I doubt it would offend. The strongest disparity between the two? The price. Le Blanc De Chanel retails for 45USD and the Lumi Magique (or Magic Lumi, if you are in the US) retails for 13USD. It’s not the same product in a repackaged form (I’ve never encountered that, if I’m honest), one can definitely tell them apart when compared on the back of the hand. That being said, the function is nearly identical and unless you are tremendously opposed to any sort of shimmer, I would consider the Lumi Magique a perfectly decent alternative. If we’re being extra nit-picky, I would recommend Chanel to paler skintones or dry skintones that would benefit from the extra emollience, while the Lumi Magique may fare better on oilier skin types as it sets completely and wouldn’t encourage makeup to migrate. As for me, I lean towards the Chanel – I’m on the dryer side and forever persuing a little more dew. Can anyone else chime in here? Do you feel they are decent substitutes? Karima, I am sensitive to silicones. Do you know if the Chanel is more silicone heavy? Thank you. It’s not as slippy as the Benefit Porefessional, for example. It does have silicones so if you are intolerant, you can safely skip Le Blanc. I tried the Chanel but I found it to be too drying. It accentuated my fine lines and made my skin look older. Now mind you I am 52 but I have good skin and most people think I look 40 something. I wanted to love it like you do and believe me I tried but for me it was a fail 🙁 For a subtle glow I like the Stila Tinted Illuminizer in shade 1. I like it alone or under my foundation. It works perfectly with my dry skin. Thank s for all your wonderful reviews and videos. I love your channel Karima! You da best!!! 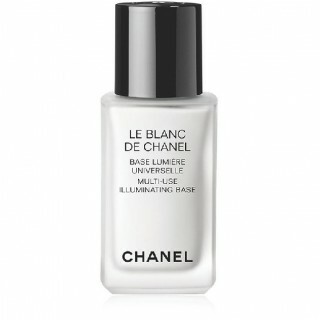 Funny that, I find the Chanel to be quite tacky and illuminating but it seems some find it to be drying. Glad you found something you liked, though! Thank you for the thorough review, Karima! I’m new to your YouTube channel (and the ShamFrip world – but, hey, I’ve got the lingo down already) and I really adore your technique and looks. I’ve learned a lot as compared to watching other beauty channels and you are a refreshing change to the cookie cutter style that is out there. Love from Toronto, Canada! “You are a refreshing change to the cookie cutter style that is out there”, I second you on that, Afreen! Gotta love Karima’s take on beauty. She’s got the eye and, if I dare say, the class. Yes, classy. That’s what I like about this blog, it’s classier than most. I find the two to be very different. I own Le Blanc and love it. I have swatched the Lumi in store and remember thinking it was very similar to the Becca shimmering skin perfector liquid in Pearl. But this was a few months ago and I might remember it wrong. Interesting! Base products can perform quite differently depending on the face so it’s good to hear some different experiences. I think the L`oreal one is a dupe for the Strobe Liquid by MAC (which is discontinued). The only thing that stops me from buying the Loreal one is that the product become “two-phased” and the smell become strange un a few months. Interesting, sounds like the product is expired. I’ve had mine for quite a while and haven’t had an issue, where do you store your makeup? I love how in-depth and intelligent your discussion of products is, and this review is no exception. I would really have liked to have seen comparative photos, and swatches though–or am I just blind and I missed them? Swatches and comparisons are near impossible to capture on camera (or at least impossible for me, I’m no professional photographer). I fixed that typo, thank you! Great review, as always, you are my favorite youtuber/blogger! <3 I would say Lierac's Luminescence serum has a similar function, but it's even pricier than Le Blanc De Chanel, although it does offer many benefits to your skin. Does anyone know by any chance how it compares to these two products? Hi. Great review. If you seek a really dewy skin finish, definitely go check out Guerlain L’or primer. It’s a great great product. A better drugstore replacement is Face Finity by Max Factor, but the cheaper dupe would be Artdeco Cosmetics Makeup Base. Hmm I own the Face Finity primer and I can’t say it imparts any luminosity on my skin, it functions as more of a traditional primer. so interesting, I do love a bit of the le blanc de chanel, especially in the winter, so I definitely have to try the loreal for a bit more highlight! I love your blog and channel so much karima, major girl crush !! The Loreal Magic Lumi seems to be a straight on dupe of the discontinued (at least in the states) Lancôme Éclat Miracle Serum of Light Complexion Illuminator. I compared the ingredients and they are EXACTLY the same and pretty much in the same order. I haven’t tried the Loreal yet as I still have some of my Lancôme. I like to use the Lancôme mixed in with moisturizer, foundation, or just on top of foundation. I didn’t like it under foundation. I’m intrigued by the Chanel (I love all Chanel…who doesn’t right?) but was wondering if you knew how the Le Blanc compares to the Base Lumiere. AHHH good to know! I tried to track down that damn Eclat Miracle for ages and gave up! I can put that lemming to rest now, thank you! I actually haven’t tried the Base Lumiere, I’ll swatch it next time I’m in store. One thing that I wish you would have done is to compare the price per ounce of these products, rather than the price straight from the store. 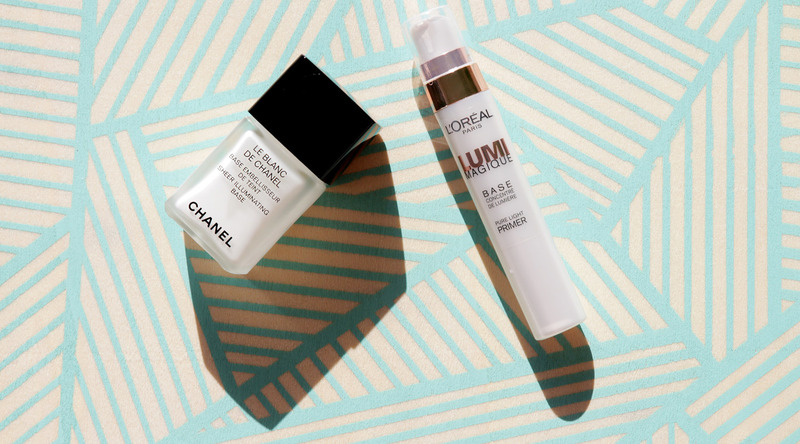 The L’Oreal Lumi primer contains 0.68 fluid ounces of product, making it around $19/oz, while the Chanel Le Blanc de Chanel contains 1 oz of product, for a price of $45/oz. So while the Chanel is still a considerably pricey purchase, it would only have been about 2x the price of the L’Oreals, as compared to the tripled price you have listed here. I know a lot of bloggers break down price per ounce, in many cases I find it to be a bit of a redundant calculation. I use the Chanel more liberally than the L’Oreal, as the latter has reflect, suddenly we have a complex equation and I try to keep it simple. Oh how I love your reviews, I always learn something / add to my collection! I really like Loreal’s lumi pen, which I think I read is a cheaper “dupe” to chanel’s highlighting pen? I have Laura Mercier’s radiance primer so I didn’t think I need to buy Loreal’s Lumi primer. That, too, is a beautiful primer that’s really natural and shines through heavy bases. I compare the glow effect of it to Argan oil. It is more golden, and since I’m pale I do get a little color from it that makes me look healthier as well. I’ll go purchase Loreal’s primer to see how the glow differs now that I see it’s a whiter version. I actually have the Laura Mercier Radiance Primer in my collection and am yet to try it! Will do so asap! Hi Karima, excellent writing! I would love to hear your thoughts on the MAC Strobe Cream – as it is also a thick and viscous liquid, devoid of shimmer (as far as I can tell), but offer a definite and rather dominant pearlescent finish. Thank you and have a great day! I’m surprised Le Blanc works well for you with dry skin types–it kinda dries my face out! A few people have mentioned that! It remains quite tacky on my skin and I haven’t noticed any dryness – quite perplexing! Karima, I know you love the Koh Gen Do foundation (my favorite too!). Have you tried the KGD makeup color base in pearl white? It seems very similar to the Chanel LeBlanc but I wonder if it’s even better because their foundation is so incredible. Also, Chanel products sometimes make me break out. I know Koh Gen Do will send samples if you ask. You might want to try it. I would ask but I already asked for foundation samples. I’ve used Dolce & Gabbana The Primer – Sheer Radiance Make up Base and was happy with that! I’ve never tried Le Blanc de Chanel so I’m not sure it can be a replacement. But according to product descriptions, there are some similarities. Anyway, D&G is also a white cream that enhances glow. I liked how my complexion looked creamy, yogurt-like, as they say in Korea. That was emollient enough for my dry/ combination skin. fantastic when mixed with moisturizer or foundation! None of these products contain sparkles/ shimmer/ glitter etc. and I would defo recommend them! Just bought l’Oreal Lumi Magique, which I though would be a dupe for the discontinued Lancôme Eclat Miracle Serum of Light Complexion Illuminator (Lancome and l’Oreal belonging to the same mother company) but it’s actually quite different. While the Lancome Illuminator imparts a kinda pearly fresh sheen, the l’Oreal Lumi Magic gives the skin a creamy quality, as Karima described before. It kinda blurs the irregularities of my skin, hence my face looks younger and rested. The l’Oreal Lumi Magic contains tiny shiny particules that arent visible on my face, excepted on my eyelids but it’s still lovely. There’s no sparkling or metallic effect though so fear not! I like to mix it with Guerlain Meteorites primer or/and with my foundation, for a natural, creamy and smooth finish. I confirm it functions effectively well as a foundation lightener (makes your summer foundation shade paler, then more suitable for winter skin), so no need to buy a separate correcting drop product. This makes for an extra interesting use. Considering that price point (although the tube is tiny), it outperforms higher end brand illuminators which may be too glittery, too frosty or too pink. Thanks for this blog post! I loved the Chanel product but had a reaction to it. Boo. Picked up the Lumi instead and that is working well for me and no reaction. I doubt I would have picked it up without reading this as I don’t buy much drugstore stuff. Have you tried using Laura Mercier’s Radiance Foundation Primer? It also adds a beautiful glow!